Featuring climate scientist Prof. David Karoly, comedian Rod Quantock, and CEO of the Yarra Energy Foundation Alex Fearnside. Beating the Bomb is the story about the biggest weapons of mass destruction ever created. It is about the people who use them, more importantly, it is about the people who fight them. Co-director and producer Meera Patel will be at both screenings and available to answer questions afterwards. Wednesday, 20th April 2011, 6.45pm. Tickets: $10/$7 (conc.) ON-LINE, $13/$10 (conc.) at the door. Click here to book. Proceeds to the Red Cross Japan and Pacific disaster appeal. To book contact Tully McIntyre: tully.mcintyre@foe.org.au or Ph: 0410 388 187. Organised by Friends of the Earth. This film explores the concept of relocalisation. ‘Going local’ is a powerful strategy to help repair our fractured world – our ecosystems, our societies and our selves. Far from the old institutions of power, this film shows us people that are starting to forge a very different future. Tuesday 3 May, 6.30-8pm, Basement Theatre, 198 Berkeley Street (cnr Pelham St), Carlton. To RSVP click here. Screening is free. YCAN’s 40th Rebranding Birthday Party! Wednesday 3 November, 5.30-6.30pm, 112 Smith St, Collingwood. 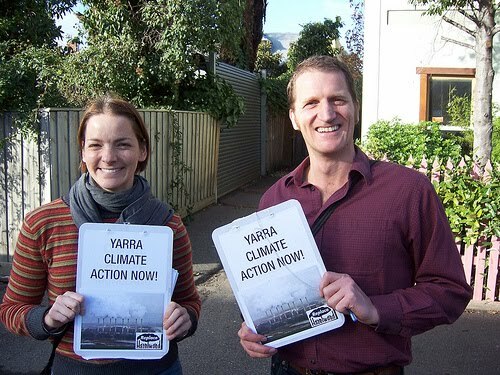 For the last nine months, rain, hail or shine, committed members of Yarra Climate Action Now have been “rebranding” (i.e. protesting) Richmond Labor MP Richard Wynne EVERY SINGLE WEEK! We would like to invite you to celebrate the 40th rebranding in a row! There will be live music, a big birthday cake and fun for the whole family! This truly epic action has been calling on the State Government to put the interests of Victorians before those of the coal industry, and they are feeling the pressure. However, with a new coal-fired power station on the cards there is still work to be done. Join this community forum to discuss the latest climate science and solutions for a sustainable future. This event is intended for people who are concerned about climate change but are confused by the current debate; those who wish to know more about the solutions and options for effective prevention of further climate change; and those who would like to move from interest to action on climate related issues. Hear from Dr Colin Hocking, environmental researcher, Yarra resident and Al Gore presenter, about the effects of climate change in Melbourne and Victoria. Entry is by donation and lunch will be available. To RSVP contact MGC parent and sustainability collective member Fiona Armstrong on 0438 900 005 or email fiona-armstrong -at- bigpond.com. Yarra Climate Action Now will be hosting an information session for people interested in being involved in the Vote Climate campaign for the upcoming Victorian Election. RSVP here to let us know if you can make it (and if you can’t but are still interested, get in touch). Details below. At the federal election, the Vote Climate campaign in inner-Melbourne helped put the climate crisis back on the agenda in a big way. Come along to this session to find out about the Vote Climate campaign for the Victorian State Election coming up in November. Vote Climate is a non-partisan campaign run by a number of local climate action groups. It highlights where the parties’ stand on this issue and encourages voters to consider climate and energy policies when deciding who they choose to vote for. A scorecard will be produced to rate the parties’ performance. This will be distributed to voters via letter-boxing, leafletting and at polling booths on election day. We will also be running fun and creative actions and events. The results of the federal election shifted the debate on climate. We need your help to do the same for Victoria. While we still don’t know who will be our Prime Minister, one thing is clear – the Greens have been the big winners in this election. Here in the seat of Melbourne, Adam Bandt won his party’s first ever lower house seat (in a general election) with a massive 13% increase in the Green primary vote (to a total of 36%) and a 10% swing from Labor to Greens two-party-preferred. Nationally the Greens gained about 11.5% of the primary vote, an increase of almost 4% from last election, by far the biggest gain for any party. It also seems like the Greens will win 5 or 6 senate spots, meaning they may win one in every state. In Victoria Richard Di Natale has been elected to the Senate with a full quota of votes. 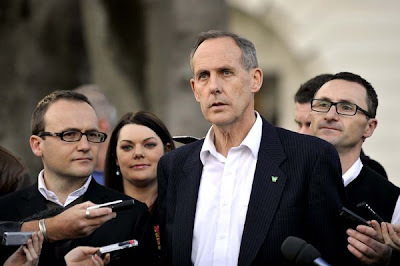 The Greens will hold the balance of power in the Senate. Both Labor and the Greens said that climate change was the biggest issue in the seat of Melbourne. This result doesn’t bode well for inner-city State MPs, who are facing an election in three months. The Brumby Government will have to vastly improved its climate policies if it doesn’t want to lose seats to the Greens. We hope this result encourages some soul-searching in the Labor Party. With both big parties offering no leadership to tackle the climate crisis, more and more people will keep turning to the Greens. We hope all parties heed the signs at this election and greatly improve their climate policies. Yarra Climate Action Now is proud to have been a part of the Vote Climate campaign in the seat of Melbourne. Our work helped make a difference in this seat and helped the party with the best climate policies win! Well done to everyone involved. Last weekend volunteers from Yarra Climate Action Now doorknocked over 1000 homes in Collingwood and Fitzroy for the Replace Hazelwood campaign. We gathered hundreds of signatures for our petition and spoke to people about the urgent need to replace Australia’s dirtiest coal-fired power station with clean renewable energy. We got a great response from the community. 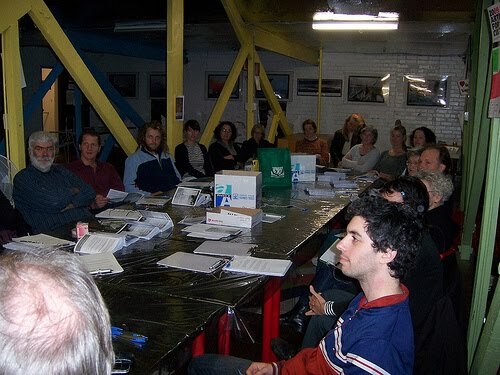 While many first-time doorknockers were nervous at the beginning, with one hour of training and practice, over 20 people hit the streets and had a good time doing it! “Thanks for the chance to participate. It was a great learning experience. “Oddly, I was pretty nervous right at the start. I was worried about how to do the opening pitch when the door was first opened. I went with my partner and watched her as she did a few houses and that helped a lot. Our next doorknocking session is Sunday 4 July in Richmond, 1-4pm (one hour training, two hours doorknocking), meeting at Melbourne Girls College, Yarra blvd, Richmond. We need your help! Sign up now here. The campaign to Replace Hazelwood power station with renewable energy (and energy efficiency) is gathering strength. You may have seen the coverage in the media recently as well as Hazelwood’s owners’ outrageous attempt to sabotage energy efficiency programs. Hazelwood brown coal-fired power station near Morwell is Australia’s most polluting power station. Replacing it with renewable energy and energy efficiency would reduce Victoria’s emissions by around 12% and Australia’s by 3%. If we want to reduce emissions, we must start by replacing Hazelwood. The state and federal Labor governments are now under pressure to act after Kevin Rudd’s backflip on climate change. So, now is the time to get the message out in the community. Over the next two months local community climate groups are going to be doorknocking in the key inner city electorates of Melbourne. Door knocking is easy, fun and one of the most effective ways of getting our message into the community and having an impact on politicians. Here is how it works. We start at 1pm and do about an hour of training, we knock on doors for less than two hours (in pairs) and then get together for a cuppa or a drink and talk about how it went. It’s easy! Residents are friendly and usually very happy to take some information or sign the petition. No prior experience or detailed technical knowledge about Hazelwood necessary – we will provide training and materials. Doorknocking will be done in pairs. 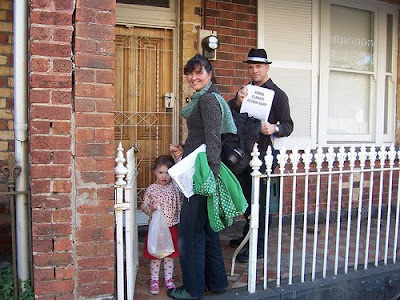 There is also doorknocking happening in Brunswick, Kensington, North Melbourne and Westgarth/Northcote. So please join us on a coming Saturday or Sunday by clicking on the link below and registering to doorknock. There is also a video showing how it works below. A video about our weekly rebranding sessions, pressuring the Labor Party and the Brumby Government to get our of the pocket of the coal industry an start doing something real about the climate crisis – such as transitioning Victoria out of coal and to renewable energy.